The photo above illustrates yet another innovative use for Hammerworks gooseneck lighting. Here SLS-508 in antique copper finish has been used to illuminate an entryway & house number in a residential setting. Hammerworks Gooseneck Wall Light SLS508 is a unique option for entryway lighting. Certainly the design is in contrast to the typical Colonial Wall Lanterns. 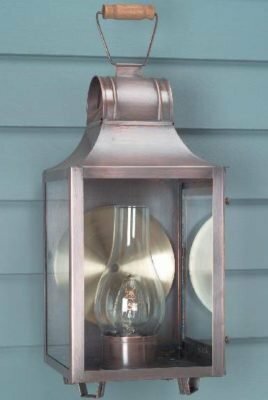 However, the charming rustic style of this simple outdoor fixture complements a variety of home designs. Therefore, anything from a Cape Cod or Lakeside Cottage to a City Townhouse is suitable for this Gooseneck Lighting Style. Most noteworthy, you can choose from the verdigris copper finish (shown here) or antique copper. In addition, we offer the option of a powder coated black arm, giving the light a nice contrast. Furthermore, each gooseneck wall fixture accommodates up to 150 watts in a standard medium base socket. Consequently, it provides plenty of light for any entryway. While Gooseneck Wall Lights are designed and used mainly outdoors, they have countless interior uses. For example, either SLS508 or Copper Sign Light SLS 507 will look great over a bathroom vanity. In addition, consider using Pendant Fluted Shade Light SLS 509 as task lighting over a kitchen island or counter. In a commercial setting, we have sold gooseneck lighting for use over restaurant tables, and even a beauty salon! Therefore, from commercial to residential applications and beyond, gooseneck fixtures provide a unique option for any interior lighting design scheme. Especially relevant, the simple style of the Gooseneck Wall Light SLS508 provides a perfect complement to many of the Colonial Wall Lanterns. 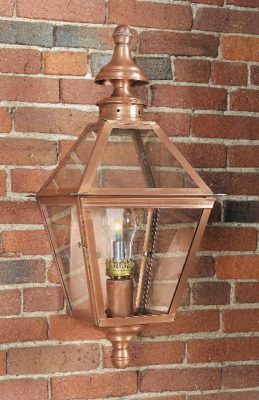 For example, you can easily mix and match it with Cape Cod Colonial Wall Lights W106 or Copper Onion Wall Lights OL12. If you have an antique or reproduction barn, consider Gooseneck Barn Lights SL503L along with the Colonial Reproduction Home Lights Barn Lantern W102. The possibilities are limited only to your imagination! Whatever your preference, you will find the right lighting for any project within Hammerworks varied collections.